I recently found a pie crust recipe that I wanted to try. And I love pie as much as the next person, but it’s not my preferred dessert. So I used the recipe for chicken pot pie instead. After all, I didn’t think Mr. Napping would be too thrilled if I served the family chocolate cream pie for dinner. He’s of the opinion that if it doesn’t have meat, it’s not a meal. I will say that this pie crust is a winner… and might just make an appearance at Big J’s birthday dinner coming soon. It was even still flaky the next day. – Thaw the chicken breasts and dice. In a large pot on the stove, combine the chicken dices and the cup of chicken broth. Cook on medium heat, stirring occasionally, until mostly cooked. – Chill the dough in the fridge while you mix the rest of the filling up. – When the chicken is mostly cooked, add the cream of chicken soup (don’t add milk or water) and the mixed veggies. Heat until the veggies are no longer frozen together and you can mix the filling. Stir to mix evenly. Remove from heat. – Roll out half of the dough and spread in a 9-inch pie plate. I am absolutely terrible at rolling pie crusts, completely horrendous. I almost always end up pressing it into the plate and skipping the whole rolling process completely. It still tastes yummy and no one knows I cheated. 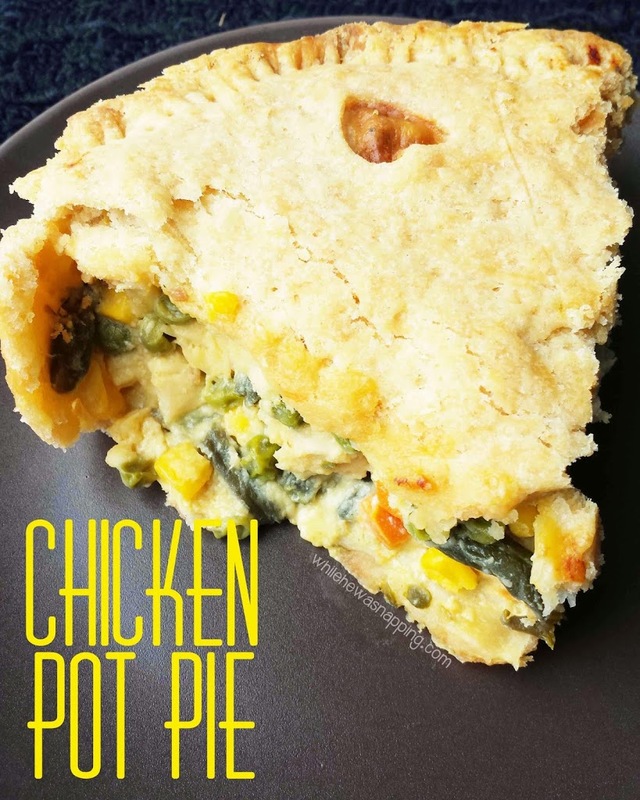 – Pour filling into the pie plate and spread evenly across the pie crust. – Roll out the remaining dough to cover the pie. Cut any decorative vents if that’s your thing. Slits cut after it’s on the pie work just as well (and make the transfer to pie plate a little easier). I have no tricks here. Just do the best you can and use a pancake turner to help lift it off the counter if you have to. – Use a fork to press the edges down and seal the pie. – Bake in the oven at 375 degrees for 45-60 minutes. – Let set 5-10 minutes. Serve. * You can use this recipe at Buns in My Oven as a substitute for the soup if you’d rather, the comments say it’s pretty delicious. 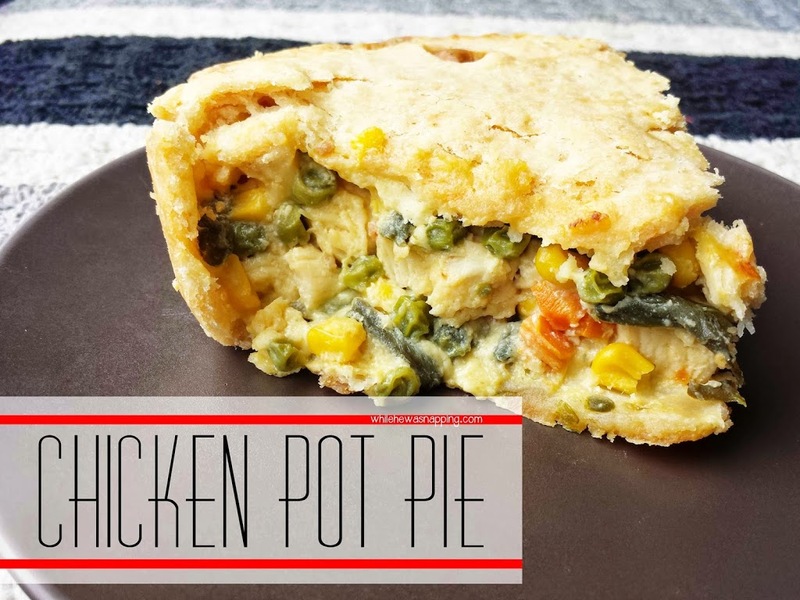 Chicken pot pie is my ultimate comfort food. I can’t wait to try your recipe. Pinned! Thanks, Heidi! I need to find a way to make the cooking stage faster. Or start cooking dinner before 7pm! Other than that, it was amazing!